For over 100 years, a cardboard tube has been in the center of toilet paper rolls. That was until Kimberly-Clark recently introduced the first toilet paper in the U.S. without the cardboard tube for use at home—Scott Naturals Tube-Free bath tissue. The simple progression by eliminating cardboard will save millions of pounds of material from being thrown out into landfills. The average U.S. household uses 17 billion toilet paper tubes, over 160 million pounds of waste annually. Although the cardboard tubes can be recycled, a survey by Scott Naturals shows that over 85% of people throw the cardboard in the trash. 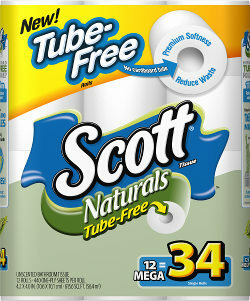 Doug Daniels, brand manager of strategy and innovation for Scott toilet paper states, "By eliminating the tube, we are making it easy for consumers to help tangibly improve the environment, without compromising on product quality or performance. We know that it all adds up, and we’re helping our consumers make a positive impact." Scott Naturals Tube-Free bath tissue does not create any change in the user’s normal bathroom routine. The product dispenses the same way as a conventional roll and is not priced any higher than regular Scott toilet paper brands. "The introduction of the first tube-free bath tissue for the home is a green step forward that exemplifies K-C’s commitment to sustainability and to developing products that meet the of today’s environmentally conscious consumers," says Doug Daniels. Scott Naturals Tube-Free bath tissue is currently being tested in the northeast U.S., exclusively at Walmart and Sam’s Club stores.